I want to change my mind on TJones 2nd pic now. Being sideways, I did not notice the jagged bottom, just the jagged fish arches. Apparently there was some decent swell, which not only makes the fish look more erratic, it can cause the marks to appear less defined (as the cone angle rocks the fish in and out of view). I would bet on something larger than most of the local Bonito. Here's a couple for you guys. Lowrance elite 7 chirp. All surface, noise clarity etc... turned off. Sensitivity 63% colorline 78% ... I found it marks pretty good and i can decipher what type of fish is under the boat but I'm thinking of switching to medium chirp or 200hz vs. 83hz so I have a better understanding of what is directly under me. Thoughts? I have not found chirp settings that I like yet, but I am new to them. I like both high and low sonar frequencies, but for different reasons. The low frequencies (and their associated larger cone angles) are better for finding areas of fish and structure. You are scanning about 4 times the area, with double the cone angle. Knowing what is right underneath you is overrated, unless you are a Lobster fisherman or fish pretty deep structure. The high frequency is better at indicating what you are looking at (based on the colors), assuming that both your sensitivity and colorline are not too high nor too low. If all of the targets (including bait schools) return the hardest color of your chosen pallet, then you are probably too high in one or both (in either frequency type). But, in my experience, the high frequency can be better fine tuned to return color differences between species. As with all other marks, the size of (and distance to) the target are going to play a part in what you see on the screen for any particular settings. Wow I dont know what settings your has that keep the image so clean because my regular 83 khz is so clustered everytime I find heavy structure, bait or fish.. 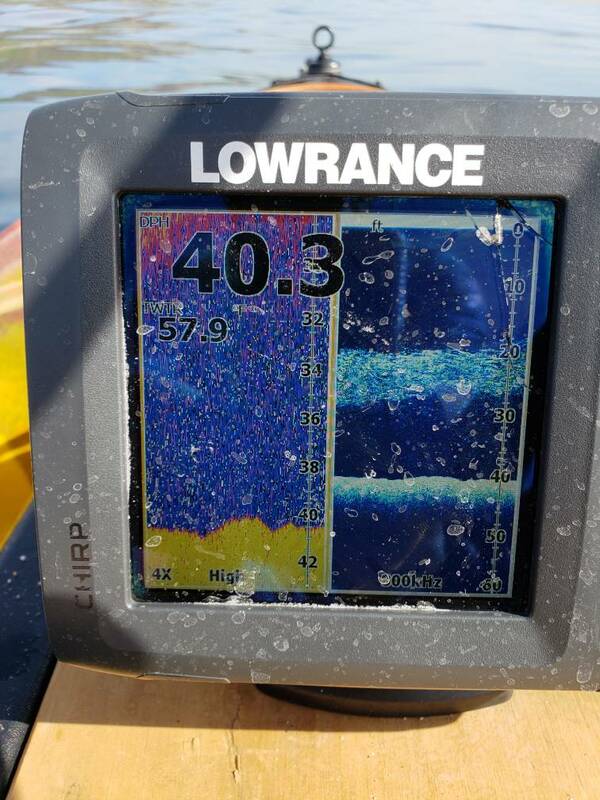 This post is great and super helpful on honing in the fishfinder! Thanx for any help on this! Looks like the high chirp is getting some interference. Might try cycling off any other electronics on board, and checking your transducer cable and pins. The crack in the screen could be troublesome too? If your transducer is not directly in the water, you might want to check for bubbles (although the downscan does not appear bad). Make sure you have the right transducer selected in the setting also. Is the "4X" on your unit scroll speed? If so, I would turn that down to normal. The 4x appears to be the amount of zoom. Agree with the rest. Yep, didn't even notice the scale on that part of the screen. Ya switched high chirp to 200 and zoomed out so much better already more clear. Dont know how to turn down sensitivity but 200 seems to correctly portray what's below thanks to both of you for all the suggestions!